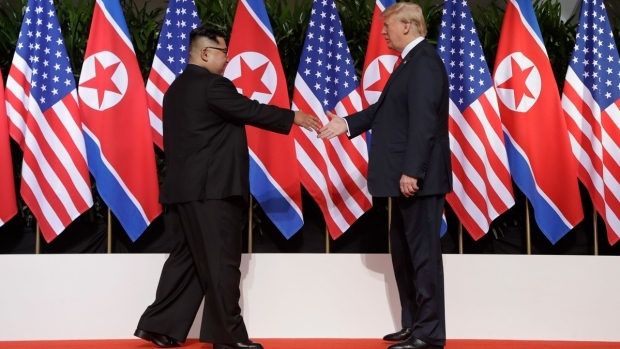 The most tangible outcome of Tuesday's summit between President Donald Trump and North Korean leader Kim Jong Un appeared to be a commitment to recover the remains of U.S. military personnel missing in action and presumed dead from the Korean War. The statement was otherwise filled with vague aspirational vows for peace and the denuclearization of the Korean Peninsula. Washington and Pyongyang agreed to hold follow-up talks at the "earliest possible date" between U.S. Secretary of State Mike Pompeo and a relevant high North Korean official. It's debatable whether North Korea's commitment to recovering U.S. war remains could count as a major win for Washington when Pyongyang would be simply returning to what it had been doing for years. Between 1996 and 2005, joint U.S.-North Korea military search teams conducted 33 joint recovery operations and recovered 229 sets of American remains. According to the Pentagon's Defense POW/MIA Accounting Agency, most of the missing Americans died in major battles or as prisoners of war. Others died along the wayside or in small villages. Many of the losses from aircraft crashes also occurred near battle zones or roads connecting them. The Veterans of Foreign Wars organization urged Trump in a letter last week to "do everything in your power to ensure that those who paid the ultimate price for freedom during the Korean War are finally returned home to their families," Stars and Stripes reported. North Korea and the United States remain technically at war because the fighting ended with an armistice, not a peace treaty. Washington officially broke off the program because it claimed the safety of its searchers was not guaranteed, though the North's first nuclear test, in 2006, was likely a bigger reason. Critics of the program also argued the North was using the deal to squeeze cash out of Washington, calling it "bones for bucks." South Korean President Moon Jae-in said Tuesday his country could help in the efforts to find the remains of missing military personnel.